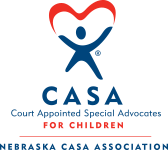 Nebraska CASA Association partners with local CASA programs to recruit and train volunteers who speak in court for the safety and well-being of abused and neglected children. Court Appointed Special Advocates are volunteers who are appointed by judges to speak in court for the safety and well-being of an abused or neglected child. Children assigned to a CASA volunteer are victims of abuse or neglect. CASA volunteers come from all walks of life. More than half of all CASA volunteers are employed full-time. CASA volunteers are well trained and supported by competent and professional staff. Judges, attorneys, child protective workers and parents overwhelmingly report that CASA volunteers make a difference with the children they serve. Children with a CASA volunteer are half as likely to spend time in long-term foster care, defined as more than three years in care. Cases involving a CASA volunteer are more likely to be permanently closed. Fewer than 10% of children with a CASA volunteer re-enter the foster care system. CASA advocacy saves taxpayer dollars by reducing children's length of stay and chances of returning to Foster Care. 824 Nebraskans volunteered as advocates for children in 2018. 2,046 Nebraska children had a CASA volunteer in 2018. Although CASA serves more children each year, there are still 1,500 children without an advocate. The average annual CASA program cost per child served is $1,013. 21 local CASA programs are currently serving 48 counties in Nebraska. CASA programs have served Nebraska children for 32 years!